Safari HQ’s series of Senior Safaris offer relaxed itineraries, fewer miles in vehicles (and over bumpy roads) and high-quality lodges or permanent tent camps that come with beds and en suite bathrooms. (In travel industry parlance, a “senior” can be anyone over 50, so don’t assume these trips are only suitable for those who pre-date the baby boomer era.) This safari travels northern Tanzania to take in Ngorongoro Crater as well as the Serengeti, Lake Manyara and Tarangire national parks, and includes Masai and other tribal visits. Safari HQ’s series of Senior Safaris offer relaxed itineraries, fewer miles in vehicles (and over bumpy roads) and high-quality lodges or permanent tent camps that come with beds and en suite bathrooms. (In travel industry parlance, a “senior” can be anyone over 50, so don’t assume these trips are only suitable for those who pre-date the baby boomer era.) This safari travels northern Tanzania to take in Ngorongoro Crater as well as the Serengeti, Lake Manyara and Tarangire national parks, and includes Maasai and other tribal visits. Jambo, on arrival at the airport you will be personally met and escorted by one of the SafariHQ guides to your accommodation at the Arusha Safari Lodge. You have the choice to unwind and relax at your accommodation, or you can explore the bustling small town of Arusha at your leisure. We recommend a visit to the Arts and Craft Market, where you can pick up local handicrafts made by local artisans. After breakfast you will be greeted at your accommodation by your SafariHQ guide who will brief you about safety in the parks whilst on safari. We will then depart for your first day of safari and make or way to the picturesque Tarangire National Park for an adventure packed day of game driving. This park is dominated by the perennial Tarangire River and is characteristically known for its giant baobab tress that stretch and wind their branches into the blue sky. 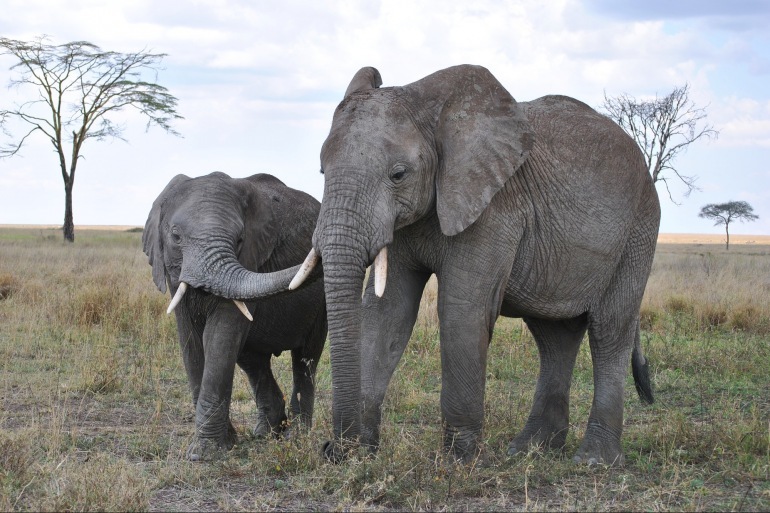 The most spectacular feature of Tarangire is its large elephant population. In fact, it has the largest population of any park in northern Tanzania. These gentle giants abound in excess of 3,000. Tarangire is currently experiencing and elephant baby boom and you will notice a lot of juniors and babies as members of the herd. Also expect to see zebra, eland, mongoose, giraffe, bushbuck, hartebeest, dik dik, impala, warthog, reedbuck. Primates you may encounter are olive baboon, vervet monkey and bushbaby. Many carnivores are abundant throughout the park such as lion, leopard, cheetah, hyena and jackal. Dinner and overnight stay at the stunning permanent tented Tarangire River Camp. a short drive to Lake Manyara National Park for an afternoon of game driving. The park stretches along the base of the 600 metre high Rift Valley escarpment. Lake Manyara covers two thirds of the park. Incredibly, the other third of the park homes a variety of animals, which are supported by open savannah grassland with rocky outcrops, marshes and acacia woodland. The park is famous for tree-climbing lions and a huge variety of birds including flamingo. Other animal found here are buffalo, zebra, hippo, leopard, elephants and giraffes. Dinner and overnight stay at the Plantation Lodge. Today, we descend into the world famous Ngorongoro Crater for a full day of game viewing. The crater is the largest intact caldera in the world and shelters some of the most beautiful wildlife havens in the world. The crater offers a unique biosphere that has remain virtually unchanged since the dawn of time. A staggering 25,000 large mammals wander the plains, lakes and forests of the crater. Have your camera ready, as the sheer density of animals has to be seen to be believed. Return to Plantation Lodge for sundowners before your evening meal. Today we depart for the world famous Serengeti National Park. Enjoy the panoramic views as we wind our way down through the Ngorongoro Conservation Area, which seamlessly melds into the great plains of the Serengeti. We will stop at a traditional Maasai Boma, where you will get the chance to see the Maasai performing their traditional dances. You may even get a chance to join in! We will then proceed to the Serengeti National Park. The Serengeti is unequalled for its beauty and scientific value and has come to symbolise the classic African Safari. Enjoy a game drive en-route to your accommodation at Soroi Serengeti Lodge. You will rise early to enjoy an early morning game drive. At sunrise you may encounter animals grazing in the beautiful light of sunrise and predators may still be busy hunting before retiring to rest for the day. Sunrise on the Serengeti is not to be missed and extraordinary photographic opportunities will abound at this magical time of day. You have the option to return to your accommodation for a hot lunch or to opt for a packed lunch which can be enjoyed at one of the various picnic sites found in the Serengeti. After lunch you will continue on a game drive. Around the time of dusk be on the lookout for lion. Cheetah can also be spotted on the plains in the early morning and late afternoon when temperatures are not too high. They rely on daylight and speed to catch their prey. Hippo pods can be seen in the bigger pools and rivers while crocodiles can be seen sunning themselves on the riverbanks. Return to your accommodation at Soroi Serengeti Lodge for a well earned sundowner before being seated for your evening meal. Today you can choose to rise early and enjoy a balloon safari(please note that this is an optional activity and accrues an additional charge with notice being required to assure your position). The balloon safari concludes with a traditional champagne breakfast on the Serengeti plains. Alternatively, you may wish to do an early morning game drive where you may get a chance to observe the nights predators on the last prowl before retiring to rest for the day or enjoy a relaxed morning around the lodge before heading out in the afternoon for a game drive. Return to Soroi Serenegti Lodge for a sumptuous dinner. Enjoy a leisurely breakfast before being taken to Seronera Airstrip for your connecting flight to back to Arusha where you will say goodbye to your SafariHQ guide and transfer to your next destination in Africa. You may want to add one of our optional activities as your next destination. Maybe a gorilla trek or you may just like to spend a couple of days relaxing on the white sandy beaches of Zanzibar.